Poverty levels in southern Honduras continue to be among the highest in the country. When hurricane Mitch hit Honduras, thousands of children were driven into poverty and orphanhood. It was against this background that SOS Children's Villages decided to become active in Choluteca. In one of Latin America's poorest countries, tens of thousands of young children continue to face neglect, abuse and precarious socioeconomic conditions on their way to adulthood. The town of Choluteca is located near the Nicaraguan border, roughly 140km south of the capital, Tegucigalpa. In Choluteca, children continue to grow up in precarious socioeconomic conditions. Poor housing, malnutrition, no access to medical services or schooling and gang violence mark the daily lives of these children. 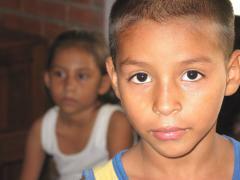 Every day in Southern Honduras, tens of thousands of children go to bed hungry. The district of Choluteca remains one of the poorest in Honduras - around 60 per cent of the people suffer from undernourishment. Not only that: nowhere else in Honduras is income distributed more unequally than in Choluteca. In a region that had already been among the poorest before, hurricane "Mitch" drove even more people into poverty and social exclusion. The number of orphaned children rose as a result of the disaster. Hundreds of houses, public buildings and roads were either partially or completely destroyed. Due to high levels of poverty, child labour remains a widespread phenomenon both in rural and urban Honduras. Young girls are traditionally involved in domestic work while boys engage in agriculture or selling merchandising in the streets. There have been reports about young girls who experience sexual harassment and abuse while working as domestic servants. Most of these children are deprived of a decent education that would eventually provide them with better opportunities to stop the vicious spiral of poverty later in life. In southern Honduras, crippling poverty marks the lives of many families. Quite often, poverty represents the main reason why children in Choluteca are deprived of parental care. SOS Children's Village Choluteca was set up in order to help and support marginalised Cholutecan families who had lost their homes and belongings when "Mitch" destroyed vast parts of the country. Although the Honduran government has implemented a number of projects to help vulnerable children in this part of Honduras, the high number of orphaned and abandoned children makes our work there indispensable. If children cannot stay with their families, they can be looked after by our SOS mothers in one of the SOS families. At the SOS Children's Village here up to 126 children grow up in 14 SOS families. Each child who arrives in our care is a unique individual, with his/her own history and needs. We offer them support in areas where they need it most. This may include, for example, specific activities or therapies, which will help them develop into healthy adults.